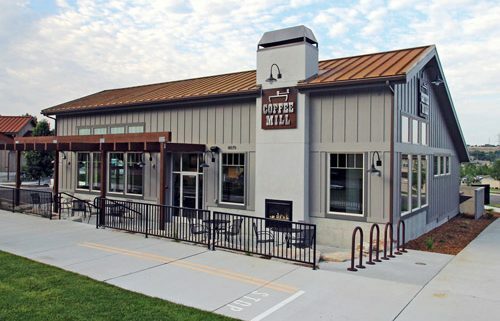 Coffee Mill at Harris Ranch - McAlvain Companies, Inc.
McAlvain provided design/build services for this 1,995 sf coffee shop and bistro located at Harris Ranch Development in Boise, Idaho. The shop reflects the ranch development style of Harris Ranch with barn lighting, reclaimed wood finishes, stained concrete floors and custom signage. Specialty items include commercial kitchen equipment, drive thru window, double sided patio/coffee lounge fireplace and coffee equipment. Landscaping includes a concrete patio, drive thru lane, landscaping and site furnishings.